Harbhajan Singh's daughter Hinaya can be seen cheering her father on ahead of their match in the IPL. 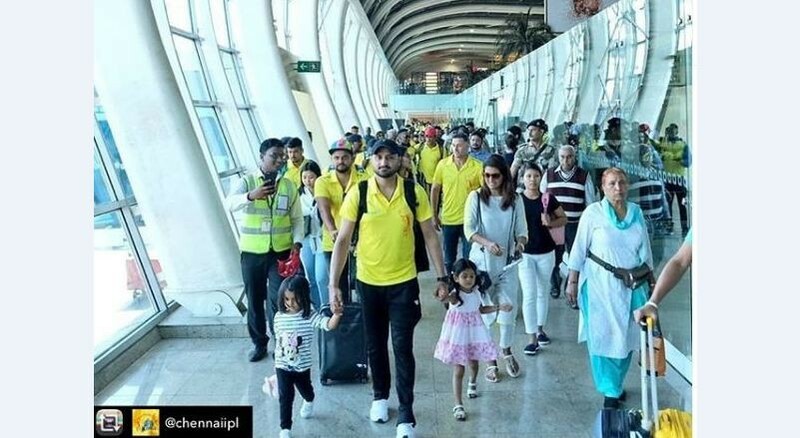 Chennai Super Kings may be a team of experienced players but the franchise is not short of young supporters as the kids of the team members are making up for the youthful exuberance that age might have taken from some of their fathers. The latest star kid to join the father is Hinaya Heer Plaha, daughter of CSK cricketer of Harbhajan Singh. In a recent video, Bhajji's wife Geeta Basra can be heard asking Hinaya who she will be supporting during the match between CSK and Kolkata Knight Riders. To the question, Hinaya responds saying 'papa' meaning father. Geeta subsequently asked which team her father plays for in the Indian Premier League and Hinaya started chanting 'CSK CSK' while sporting an adorable smile. Hinaya's support was well received by her father on the pitch as he helped CSK beat KKR convincingly to reclaim top spot on the points table from the Kolkata outfit. After CSK won the toss and elected to bowl first, Bhajji was tasked with bowling to Sunil Narine in the batting power play. Narine has historically been extremely potent at plundering spinners during the power play. The West Indian had till the CSK game hit 111 runs in 5 overs of spin bowling. But Bhajji used all his experience to not bowl in Narine's hitting arc as he tossed the ball up, slightly away from the batsman on a good length at minimal speed and allowed the sluggish Chennai pitch to take over. The ball subsequently held up on the surface, turned and took the outer slice of Narine's willow as he advanced down the track to tonk the ball over long off. The ball ballooned up and Deepak Chahar ran towards the boundary from backward point to take a smart catch. Bhajji also dismissed Piyush Chawla at a crucial juncture in the innings when a partnership between the leggie and Andre Russell was threatening to take the game away from CSK. Coming to bowl in the 16th over when Chawla was looking to break free, Bhajji outfoxed his 2011 World Cup winning teammate by tossing a ball so wide of off stump that an advancing Chawla could not reach it. MS Dhoni completed the stumping to help his off-break bowler finish with figures of 2-15 in 4 overs. Bhajji also took a sharp catch in the match against KKR at midwicket to dismiss Dinesh Karthik when the KKR captain had found his groove and was milking the bowling in his usual manner. CSK went on to win the match by 7 wickets as their batsmen chased down the paltry total of 109 with more than 2 overs to spare.